Science fiction is a worldbuilding genre. Telling stories about time travel, alternate universes, new technologies or alien species, SF allows writers and readers to speculate about the existence of other worlds. SF stories demand the invention of material and cultural environments that engender these worlds and the beings that inhabit them: from space-time to ecosystems, languages, laws and social norms. In some cases these storyworlds manifest near histories or far futures extrapolated from a world that a reader will recognise as their own; while in others we are invited to travel to new worlds—transported into virtual realities, or journeying through deep space to distant planets. Once described by Sarah Lefanu as a genre under ‘colonisation by male writers’, SF has been characterised as a playground for childish, technophilic and imperialist masculine imagination. While Aliette de Bodard rightly asserts that colonialism is ‘embedded’ in the history of the genre, in more recent times feminist fans and writers have challenged the norms of what Helen Merrick calls ‘malestream’ SF. Subverting images of extra-terrestrial invasion, intergalactic warfare and sprawling space settlements that define a genre dominated by straight white men, these feminist fictions make other perspectives the subject of the story. Acts of feminist worldbuilding in SF create the conditions for unknown futures, the evolution of social structures and the emergence of different beings—as demonstrated in stories as diverse as Naomi Mitchison’s Memoirs of a Spacewoman (1962), Octavia E. Butler’s Dawn (1987) and Vandana Singh’s The Woman Who Thought She Was a Planet (2008), among others. Decentring the dominant narratives of SF also allows other aspects of the genre to be unpacked and re-considered. The representation of time in SF and different interpretations of reality, for example, are central to feminist explorations of the genre. Ursula Le Guin suggests that the speculative, shapeshifting space-time of SF offers a narrative form that can be used to challenge ‘the linear, progressive, time’s-(killing)-arrow mode’ in which the history of humanity had been previously conceived. While the ideals of ‘progress’, ‘development’ and ‘civilisation’ may continue to be reproduced within the terms of what Joanna Russ calls ‘straight fiction’, the fact that SF untethers its reader from reality allows other worlds and alternative worldviews to be brought to life. In his description of SF’s relation to reality, Samuel R. Delany differentiates the events that take place within these storyworlds from both realistic fiction, which ‘could have happened’, and fantastical events, which ‘could not have happened’. According to Delany, the fact that SF always tells stories ‘that have not happened’ could therefore constitute an alternative definition of the genre. For feminist fans, this generous characterisation opens up the terms of SF to encompass radical speculative storyworlds that might otherwise remain estranged from this canon. 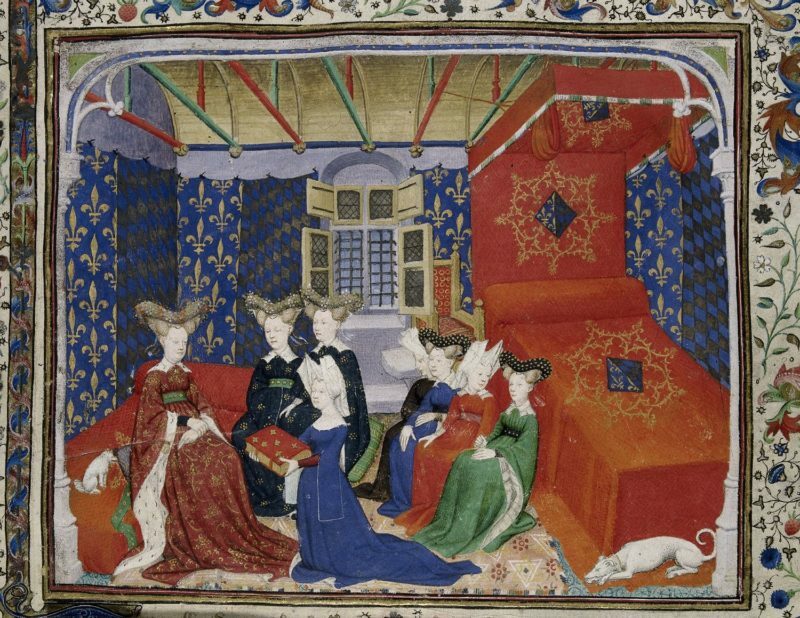 In this way, we can trace alternative genealogies of feminist imagination; drawing connections, for example, between contemporary texts and the worldbuilding strategies of Christine de Pizan’s The Book of the City of Ladies (c. 1405). Despite being written well before the terms feminist and SF enter popular usage, this critical, creative and future-oriented story wilfully transcends its historical moment. The dazzling illuminated manuscript that houses the City of Ladies represents the cutting edge of technological innovation in Pizan’s own time, while her simultaneous depiction as both the story’s author and its central character suspends her narrative voice between different temporal dimensions [Fig. 1]. 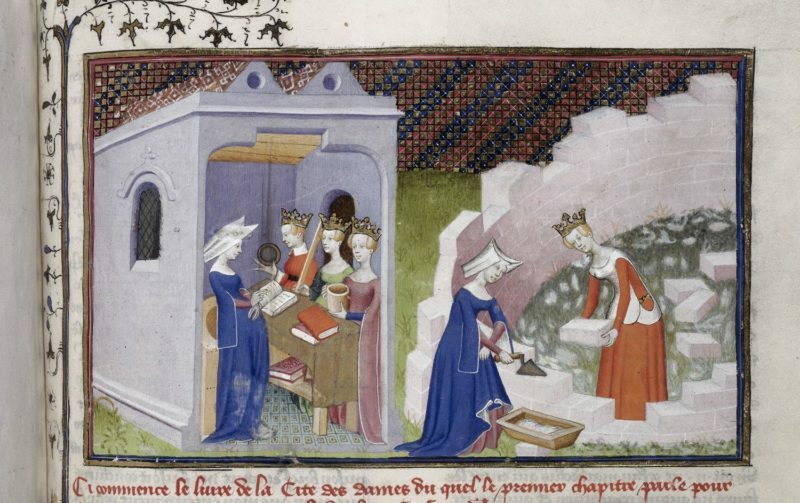 The conceit of an on-going dialogue between the character of Christine and three allegorical virtues (Lady Reason, Lady Rectitude and Lady Justice) allows Pizan to engage speculatively with the realities of her life as a widow, mother and court writer for Charles VI of France. In the text, she speaks through each of the four characters to question the logic of patriarchal laws and misogynistic rhetoric that embody the assumption of man’s mastery over every dimension of the medieval world—from natural to cultural, material to spiritual. As the character of Christine describes, construction begins by clearing the fertile plains of the ‘Field of Letters’ with the help of Reason—excavating the ground of misogynistic discourse and carrying this ‘dirt’ away by the ‘basketful’. Having been instructed by Rectitude to ‘mix the mortar in your ink,’  Christine then proceeds to lay down the stories of the many brave, brilliant and virtuous women of history—from the noble warrior Queen Semiramis to the redeemed sinner Saint Afra [Fig. 2]. Tales of women from ancient civilizations form the foundations and stones that fortify the walls and towers, while accounts of various Christian saints adorn the high, gilded roofs above. Once the City is complete, Justice throws the gates open to ‘ladies of different social backgrounds, maidens, married women, and widows,’ who are implored by Christine ‘to increase and multiply our City’ by taking refuge within its ‘fair and sturdy mansions’ from the ‘strange and deceptive tricks’ of men. The walls of this City thus define a protective periphery within which ‘ladies from the past as well as from the present and future’ are sheltered from the ‘deadly and painful poisons’ of misogyny. Even the murderous figure of Medea is welcomed to the City—generously celebrated for her knowledge of science and art, as well as her enduring love for the undeserving Jason. As Marina Warner notes, the story of Medea is told in this context, ‘without mention of the demented dimension of her despair, with the murder of her children overlooked.’ Writing her counter-history, Pizan makes space for female intelligence and achievement in a world that has been historically both ruled and narrated by men. As such, the book itself performs as a textual sanctuary for vilified women—a feminist fortress in which future readers are invited to dwell. In order to clear the ground and build this storyworld, it is necessary for Pizan to approach the received wisdom of her age with a suspicious attitude and a speculative imagination. While acknowledging that history has been conceived in a certain way, Pizan defiantly asserts that this story can be re-written. Her practice of citation—which subjects legal treatises, Biblical tales, ancient myths and the romantic poetry of her male contemporaries to radical revision—anticipates the labours of subsequent feminist writers who have come to understand citation, in the words of Sara Ahmed, as, ‘a rather successful reproductive technology, a way of reproducing the world around certain bodies.’ Refusing to reproduce the same stories, Pizan constructs her City of Ladies with narrative blocks hewn from these rough depictions of women. Her imaginative re-working gives form to a series of stories that have not happened: polished, embellished, and bound together in a precious manuscript designed to reflect the glories of women back to her readers, this world is built to nurture the possibility of feminist futures that break with the past. Snap, snap: the end of the line. In a feminist and queer genealogy, life unfolds from such points. You must listen. You must understand that the patriarchy is coming back, has returned (in fact) in two days. By no design. You must understand that I have no music, no books, no friends, no love. No civilization without industrialization! I’m very much afraid of death. But I must. I must. I must. As a reader engaging with these textual artefacts in the present, these future-oriented stories from the past invite us to re-think the myths and histories that condition our sense of self, our perception of reality and our place in the world. SF gives us a language that makes it possible to tell stories that have not happened—laying waste to certain worlds in order to build others from what remains. It is for this reason that feminist theorist and SF fan Donna Haraway returns again and again to this rich canon, seeking different ways ‘to narrate—to think—outside the prick tale of Humans in History.’ The slippage between different realities in SF, Haraway suggests, creates readers who are ‘more generous and more suspicious’ towards the worlds they inhabit—both within and beyond the imaginative boundaries of fiction. Tracing genealogies of generosity and suspicion back through the fragmented history of feminist practice serves to remind us that this speculative attitude remains an invaluable resource as we strive to build more feminist worlds for the future. Sarah Lefanu, In the Chinks of the World Machine: Feminism and Science Fiction (London: The Women’s Press Ltd, 1988), 4. Aliette de Bodard, ‘Preface’, in We See a Different Frontier: A Postcolonial Speculative Fiction Anthology, ed. Fabio Fernandes and Djibril Al-Ayad (S.l. : Futurefire.net Publishing, 2013), vi. Helen Merrick, The Secret Feminist Cabal: A Cultural History of Science Fiction Feminisms (Aqueduct Press, 2009), 15. Ursula K. Le Guin, ‘The Carrier Bag Theory of Fiction (1986)’, in Dancing at the Edge of the World: Thoughts on Words, Women, Places (New York: HarperPerennial, 1990), 170. Larry McCaffery, Across the Wounded Galaxies: Interviews with Contemporary American Science Fiction Writers (University of Illinois Press, 1991), 196. Samuel R. Delany, The Jewel-Hinged Jaw, ed. Matthew Cheney, Revised edition (Middletown, Conn: Wesleyan University Press, 2009), 32. Christine de Pizan, The Book of the City of Ladies, trans. Earl Jeffrey Richards (1405; repr., New York: Persea Books, 1982), 16. Marina Warner, ‘Foreword’, in The Book of the City of Ladies, by Christine de Pizan (1405; repr., New York: Persea Books, 1982), xvi. Sara Ahmed, ‘Making Feminist Points’, Feministkilljoys | Killing Joy as a World Making Project [accessed 2 December 2015]. Sara Ahmed, Living a Feminist Life (Durham: Duke University Press, 2017), 192. Joanna Russ, We Who Are about To… (Women’s Press, 1977), 47. Ahmed, Living a Feminist Life, 199. Russ, We Who Are about To…, 168–69. Ahmed, Living a Feminist Life, 210. McCaffery, Across the Wounded Galaxies, 187. Donna J. Haraway, Staying with the Trouble: Making Kin in the Chthulucene (Durham and London: Duke University Press, 2016), 40. Donna Haraway, ‘The Promises of Monsters: A Regenerative Politics for Inappropriate/d Others’, in Cultural Studies, ed. Lawrence Grossberg, Cary Nelson, and Paula A. Treichler (New York: Routledge, 1991), 326.